Can be ordered with an 8mm or 14mm front edge to suit different thickness of floor. Supplied in 1.35m lengths and can be trimmed to fit easily. Edge trim has a self adhesive tape for quick easy fitting, no need for drilling and screws. Suits: Split Screen, Bay Window, Type25 plus many more uses for boats and caravans. 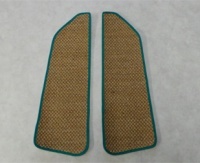 An easy to fit Ali edge trim for classic camper vans. Can be ordered with an 8mm or 14mm front edge to suit different thickness of floor. Supplied in 1.35m lengths and can be trimmed to fit easily. Edge trim has a self adhesive tape for quick easy fitting, no need for drilling and screws. Creating a great looking checker vinyl floor in your campervan is quite a simple task here are a few tips for you to follow. Preparation - Your checkered tiled floor will only look as good as the sub floor you start with. When we fit floors in vans we always start with a Closed Cell underlay followed by a new sheet of 9mm Plywood. This will give you a great base to start with, however it is possible to cover over some existing floors but you will need to understand what your doing and that it may need a different type of adhesive to the one we usually recommend, it will certainly change the "open time" of the adhesive. Adhesive - Select the right adhesive for your installation, we have spent time and money trialing different types of adhesives. We now recommend that our tiles are fitted with Madmatz Pressure Sensitive Vinyl Flooring Adhesive it even comes with a spreader to make sure your have the right amount of adhesive on the floor. Fitting - Its a fairly simple task made easier if you have done your floor preparation. Read through the fitting guide, mark out your starting point and take your time. Take note of the adhesive open times, start to early laying into wet adhesive and your tiles will slide around while fitting and you may get adhesive come up between the tiles. Finishing Up - Once you have laid your new floor clean off any adhesive that may have got onto the tiles then apply a few coats of Madmatz Floor Polish, this will protect your floor and give it a lovely shine.